It’s time to commence with another school year. Spare a thought for the trepidation faced by students harassed for having disabilities. Typically going back to school means seeing old friends and making new connections, and while most kids are nervous about going back to school, some kids are actually terrified. Research suggests that between 150,000-200,000 students are bullied in our schools every day. Many school systems have even added hotlines and “Student Resource Officers” (SRO’s) who can help identify and prevent bullying. Still bullying happens, and statistics show that students with disabilities are more at risk. In fact, anyone who looks different, acts different, or believes something different from whatever is the local cultural norm is a target. Not only do students with disabilities sometimes look different from non-disabled peers, but students with certain disabilities like dyslexia or dysgraphia also learn differently, and students who learn differently often receive additional resources or extra help which can bring unwanted attention from potential bullies. Growing up is hard but growing up with a disability brings a different set of challenges. Social stigma, misunderstandings, or lack of awareness affect the learning environment when educators, parents, and other students aren’t paying attention. What does all this mean? It means families should talk more. It means we must be more intentional in our efforts to address the problem without causing more trouble for the kids who are prone to be bullied, and without arming bullies with information that makes them wise enough to avoid intervention. Yes, it’s that complicated. In 2013, the increasing number of students with disabilities being bullied prompted the U.S. Department of Education to release a “Dear Colleague Letter” reminding schools of their responsibility to provide a bully-free education, and to implement specific strategies to effectively prevent or stop bullying of all students, but especially those with disabilities. Parents of students with disabilities or any sort of difference should be vigilant and listen to their kids when they’re discussing school. Pay attention to changes in behavior, especially aggression and meltdowns. If your instinct tells you there may be an issue with bullying, talk with teachers or other adults and ask about changes in behavior or attitude. It’s a challenge for us as parents not to want to handle things completely on our own, but parents should avoid confronting others about bullying until they have all the information, and it’s best to leave the confrontation part to the school. Discuss the issues with teachers or administration. They may be able to give you valuable insight before you talk with the other parents or take your concerns to a different level. Some adults are inclined to let bullying go assuming that kids will just “work it out,” and some students do work out one-time incidences, but sadly, true bullying involves a pattern of inappropriate behavior and when left alone can worsen circumstances for everyone involved. In some instances, students may truly not understand that their actions are being perceived as bullying. They may simply be seeking attention. However, in other situations they know exactly what they’re doing. Parents should never just “let it go” or trust the situation to work itself out. Talk to your kids, and listen. Listen to what they’re saying, and to what they’re not saying. Student suicide rates are on the rise. Quick, proactive communication and education is key, and could save lives. The best way to prevent students from becoming bullying statistics is to know your students and their disabilities, understand the law, encourage peer intervention (because intervention by peers is considered the most powerful deterrent to bullying), and to foster open positive relationships between parents and schools. Going back to school is always going to be a little nerve wracking. Kids will always worry about classes, friendships, and keeping up with the latest fads. But they should never have to worry for their safety. And for a even more creative and instructive approach. Your teens are getting ready to head back to high school and some of them are just beginning as freshmen. All summer long, I have been working with focus groups of teens and they have been talking to me and to each other and have been quite candid about their thoughts about bullying. They have shared their most intimate experiences, their concerns and their very creative ideas about how to deal with bullies. 1. 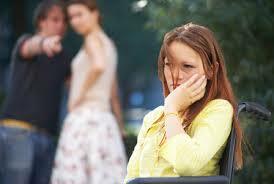 The majority of your teens report that while they may not have been bullied, they have witnessed a peer being bullied. 2. They have not always been sure how to intervene at these times, but they have ideas. 3. They frequently and in large numbers report that an adult should be told about bullying incidents, but feel that even when they tell adults the adults are NOT likely to intervene effectively. They report that adults look the other way, don’t take bullying seriously enough and even give meaningless consequences to the bully. 4. By and large, the well-spoken and passionate teens feel that the adults are letting them down in this arena. YIKES. I know that no adult in a position to help teens wants to be seen as ineffective and dismissive. a. attempting to befriend them in the hope that a bully can become an ally. b. making the bully laugh so that the bully learns a different style of interacting. c. letting the bully know the impact that they are having on others. Many teens feel that bullies are clueless about their painful impact on others. d. asking them about their lives. Many teens feel that bullies are probably hurting. It’s amazing isn’t it that teens feel empathy for bullies? e. they have even expressed that you raise your kids to have empathy so that they are less likely to act in a socially aggressive and emotionally painful manner. These large groups of male and female teens have been telling me all summer long that they are concerned that some parents may inadvertently be raising bullies. 1. They see many parents acting as bullying role models for their kids. They worry that you may be encouraging exclusivity, cliquey behavior and even physical aggression. Teens are and always have been watching the adults around them. 2. They think that adults should curtail gossiping because kids mimic them and gossiping is one of the worst and most hurtful forms of social bullying. They are on to something here; aren’t they? 3. They worry that you are bullying your kids in the privacy of your homes and that your kids are going to school upset, frustrated and looking for a place in which to practice what they have learned at home. 4. They are concerned that you might not even have given consideration to the idea that your own kid may be the bully. They think that you should consider this idea and work with your teen to be a kinder and more empathic individual. I do not want to leave you with the impression that teens all blame the adults in their lives for the bullying behaviors of teens. Many teens reported learning empathic and pro-social behaviors from their parents. Amen to the child-rearing style in those homes. We need more of that. We need parents to realize that you are your teens’ most important role models. I have been saying this for years. Take this important opportunity in your life to teach your kids that their words and behaviors can either soothe and comfort or destroy the hearts and souls of their peers. Do not ever rule out the thought that your own child may be the bully at times and if you suspect this then work with your child to change this behavior. We all remember own experiences being both the bullies and the bullied. None of us flourished from these experiences. In fact, many of us became emotionally and physically sick during these times. Your kids and I are calling upon you to be aware of your role and power in helping to both raise good kids and to become even more aware of the terrible interactional cycle of bullying that continues to persist in high schools all over. Click on the link to read Girl Gets taped and tied to tree and ‘sexually assaulted’: Where Were the Teachers?